Bhutan is a small Himalayan country in South Asia, landlocked between China in the north and India in the south. The country’s development policies and plans are guided by the concept of Gross National Happiness, which stresses the achievement of equitable and sustainable development over economic growth. The national poverty rate of Bhutan is at 12 percent, as of 2012. However, the country is still challenged by its mountainous terrain and poor road access isolating rural populations from markets and social services and limiting their livelihood opportunities. With a majority of the population living as rural farmers in small villages scattered throughout the mountainous landscape, logistical challenges impede access to social services. Close to one-fourth of the population suffers from seasonal food insecurity, especially during the months before the harvest. Bhutan relies upon India for more than 80 percent of its imports; 34 percent of the country’s cereals are imported, and limited exports earnings are not sufficient to finance all foreign exchange requirements. A booming construction industry, especially for hydropower projects, and increasing availability of credit facilities has led to rising domestic consumption. The Government has responded to these imbalances by imposing some austerity measures, including import controls on vegetables that can be grown locally. The Royal Government of Bhutan considers education as the key to alleviate poverty and empower people, and as such, the sector receives the highest priority and emphasis: 16.7 percent of total government spending, 7.3 percent of the GDP. WFP has been present in Bhutan since 1974. 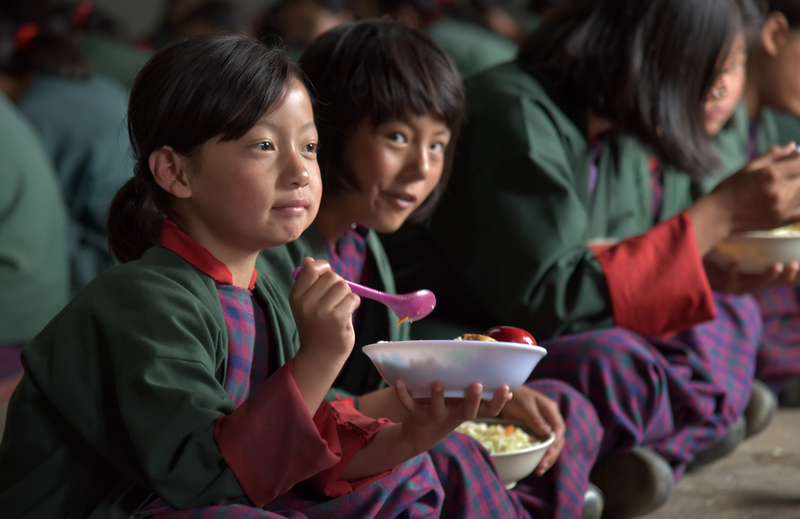 WFP supports the Government of Bhutan to become self-reliant in the management, coordination and implementation of a cost-effective, equitable and quality national school meals program. The Royal Government of Bhutan has been implementing school meals for more than four decades and the support it has been receiving from WFP over this period is gradually being phased out. WFP’s Development Project is the final project to facilitate this transition process by transferring knowledge, systems and skills to the relevant government partners. The residual number of students supported by WFP is gradually reducing with responsibility for a certain number being handed over to the Government on an annual basis. By the start of 2019 school year, the responsibility for all schoolchildren will have been absorbed by the Government. To strengthen the capacity of the Ministry of Education to be an effective steward of a nationwide school meals program. To maintain access to and gender parity in primary education that contributes to enhanced learning. In line with these objectives, WFP pursues two interrelated strategies: firstly, to continue supporting primary schools in remote areas, gradually handing over this responsibility to the Ministry of Education, and secondly to strengthen the capacity of the Ministry to set policy and priorities, manage the supply chain and oversee programs, so that it can independently administer the nation-wide school meals program.